I generally walk around confident in my data hoarding. I have software to watch my back and, short of a massive solar flare, I don't worry about the safety of my stash. Here's what my system looked like three months ago. I have a Synology NAS with 16 TB of storage.1 Hazel runs on my Mac to sweep away photos, videos, and downloads. I have Backblaze backing up my Mac. Every six months I refresh a drive that contains just my family photos, financial documents, and home videos. I keep that locked up at work. Finally, I had Amazon Cloud as a backup of my entire Synology NAS. That seemed pretty safe. Until most of it went away. During the summer, Amazon discontinued their unlimited cloud storage service for Prime members. They didn't just raise the price, they also capped the total storage allowance. 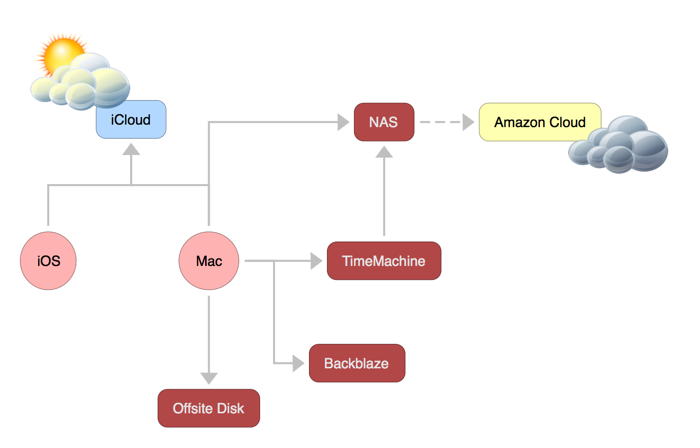 After pricing out S3 and Glacier, I decided it was not a good investment.2 So the logical step was to discontinue my Amazon Cloud backup and arrange for another way to backup my NAS. Step one was easy. I deleted my Amazon Cloud data and canceled my account. Easy. Step two took me a bit too long. Life continued to happen while I mulled over my options. Then one day I went to watch Plex and my Synology NAS wasn't listed. Ok. That can happen. I could probably just re-launch the Plex server app and get back to My Neighbor Totoro. I can't connect to the NAS login page. Alright, that's weird. So I walk down to my basement and see something a little strange. My Synology 1815+ is just blinking one light at me. Usually every drive has a light that's blinking like crazy. This time just the power button is blinking blue. So I unplug and shake some chicken bones. I remove the extra RAM for good measure. No luck. This is where the happy twist happens. I contact Synology support through their website and report the issue. After some back and forth and a few more failed attempts at revival I get an return authorization and a UPS shipping number. I bought the Synology in 2014 and now I get a complete replacement at no cost. That's a good deal. Next, I take out every drive and place them in order in a box. I feel a little obsessive but there are about 40,000 different ways I could arrange these eight drives before I get them back in the right order so this feels like a good use of my time now. Fast forward a while because I still had other stuff to do and incidentally we have a nuclear war threat for the second time in my life so my priorities are out of whack. I finally ship out the broken Synology three months after it died. Here's the thing about Backblaze backups: After you delete a file from your computer you have about 3 months before it's removed from the Backblaze history. Because of my delays and lack of attention, one of the Nerds on Drafts recordings vanished. That was a small price but an important reminder. Now we get down to the payoff. Synology is a great company. Two weeks after I ship my little NAS coffin back to Synology, I contact them and find out there’s some delay in the new unit but that I am definitely getting one. Two weeks after that I get a present delivered and I’m rarely so excited to get anything from Korea. I still don’t know if I’ll get any of the data back. I install the extra RAM card in the new NAS and then turn and look at a little brown box on my shelf. Remember those eight drives I put in perfect order at the start of this tale? That was important. I gingerly slip each disk back into the NAS. Click. Click. Click. Wait, did I put them in left to right or right to left? What if I turned the box around at one point? Click. Click. Click. I’m down to the last two SSD caching disks. I power up the NAS and walk out of the basement with very little optimism. Comfortably back in front of my Mac, because this can't be done from an iOS device, I fire up the Synology Assistant application which immediately scans my network. I feel a glimmer of excitement as it finds a NAS device named "Groot" but instead of one it finds 6 of them. I select them all and click the very obvious "Recover" button. A few minutes later I'm told that the NAS is ready to go. So I go to the login page where I'm rewarded with a my NAS and all of its applications ready to update (because it's been months since they saw the update server). Within an one hour of getting a replacement Synology 1815+ I was back up and running, fully configured, updated and connected. Minor adjustments were required to get back to 100% but nothing that required an engineering degree. So, what have I learned? Probably not what you think. I'm pretty tired of managing my own backups. I have technology exhaustion and the tedium of constantly monitoring and managing multiple backups has made me complacent and nonchalant. I really just want this all solved for me without running my own system of hacks and tweaks. So all of my photos are now in iCloud. My NAS is still running and still backing up my Mac but half of my life is on iOS now. I like Plex and I like owning my own media, but I've already repurchased almost everything on iTunes. Once Studio Ghibli is on iTunes, I may never need Plex again. 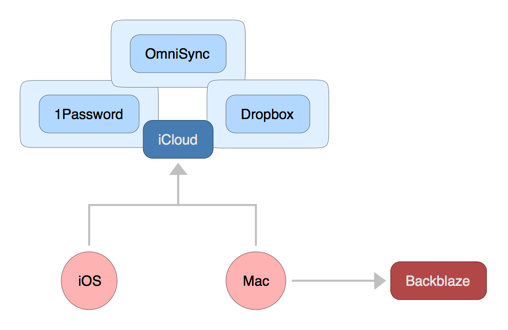 I also need to remove my Mac from the center of my backup routines. I use my Mac much less than I once did and iOS is becoming the place where I start (and sometimes finish) my work. The Synology is as close to trouble-free as I could ask for, but it's still a piece of hardware I have to manage. When it dies, it's my problem. Next time it dies, I hope that I have a better backup in the cloud. I hope Apple figures out iCloud and a TimeMachine alternative for iOS.